A perfect paint application starts at bare metal. Our process has changed and is better! How the old paint is removed, getting down for the bare metal respray has always been a “process”. 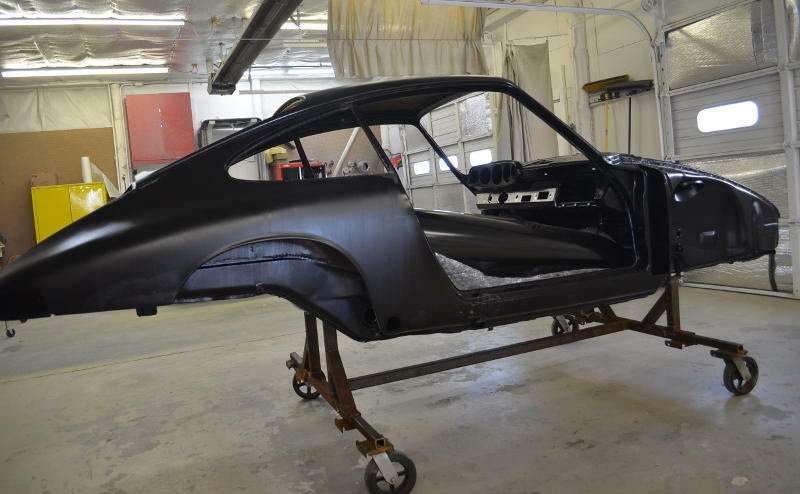 Currently, here at Easton Muscle & Custom, we think we have a better method to get the paint, bondo and undercoating off – and preserve your car’s body in the process. Previously, we would laboriously strip to bare metal by blasting with reconstituted glass. Hand strip the undercoating, then use epoxy primer to stop rust. Now, we send the disassembled shell out and have it dipped in a tank that removes everything down to bare metal. There is no metal distortion, which can happen with blasting. Paint and rust are removed in areas that we could not blast. The stripped shell is then put into another tank and the stripper is neutralized. This is a crucial step. If not neutralized completely, the etching process will continue for years. Once neutralized, the shell is ecoated – a process used by the factory. Ecoating is the black finish. It goes everywhere there is bare metal due to the electrical charge difference between the charge on the body and the charge of the paint. The coating is attracted to the bare metal and will end up as a uniform thickness over the entire body. It gets into the tiny seams and crevasses that spraying primer cannot get to, because of the air pressure blow back. Ecoat will prevent rust almost forever. It is the best investment you can make when restoring your car.